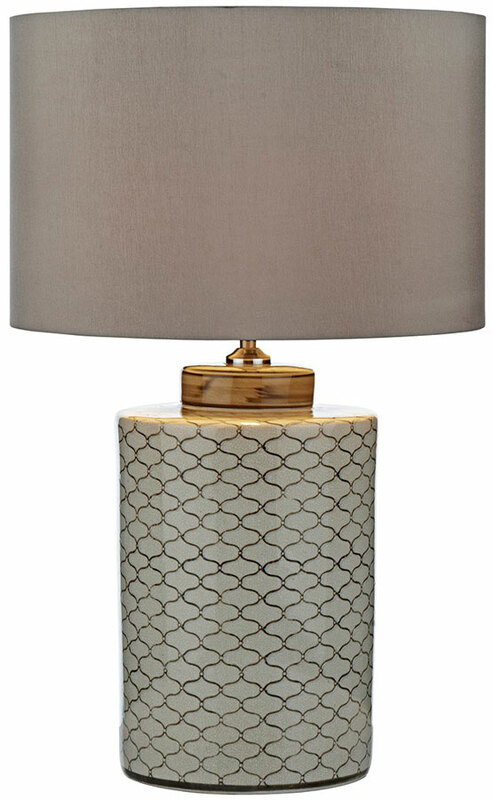 This Dar Paxton cream and brown ceramic table lamp base only features a geometric Victorian style pattern. A traditional glazed ceramic Chinese barrel table lamp base, with cream and brown tile pattern and antique cream lid. Fitted with a convenient inline rocker switch. Supplied as a base only but shown here fitted with a 15″ taupe faux silk lamp shade (S1120) that can be purchased separately and seen below. Alternatively, any medium sized lamp shade of your choice can be matched with the base. Please note that the dimensions given below are for the base only and do not include a shade. A class 2 double insulated table lamp, no earth required. Dar lighting is widely recognised as one of the leading suppliers of a full range of innovative, quality lighting products such as the Dar Paxton ceramic table lamp base you see here.